Last night, in the co-main event of UFC 234, middleweight legend Anderson Silva lost a decision to surging middleweight contender Israel Adesanya — but he’s not ready to hang up the gloves quite yet. Instead, Silva is hoping to return to the cage at UFC 237, which goes down this May in Curitiba, Brazil. Post-fight, the Brazilian reiterated his desire to fight on this card, and named Nick Diaz, who he battled to a no contest in 2015, as potential opponent. “I think it makes sense for me and Nick Diaz to fight in Curitiba,” Anderson Silva said after UFC 234. Shortly after the middleweight legend made this comment, former UFC lightweight and featherweight champion Conor McGregor chimed in and offered to fight Nick Diaz’s younger brother Nate Diaz on the card. McGregor and the younger Diaz brother have fought twice previously, going 1-1 across two exciting fights. After watching UFC Fortaleza earlier this month, Conor McGregor expressed interest in fighting in Brazil, and it seems this interest has not subsided. That being said, McGregor has recently been linked to a fight with fellow lightweight contender Donald “Cowboy” Cerrone, perhaps as soon as this summer. Both fighters have expressed interest in this bout, and UFC President Dana White has given it his seal of approval. Interestingly, McGregor has also recently expressed interest in fighting Anderson Silva. Whatever the case, it seems the Irish superstar is indeed keen to get back into the cage, and soon. 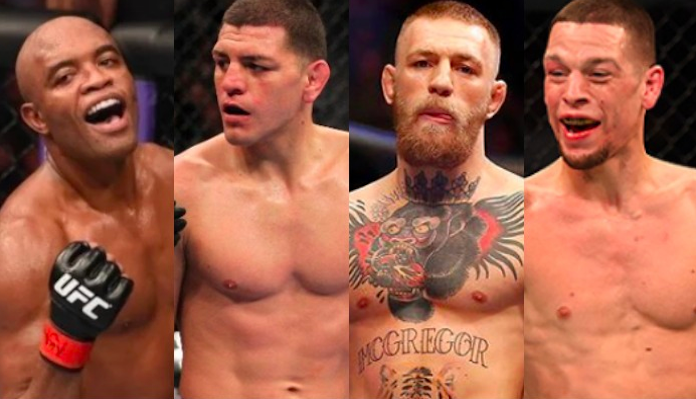 Do you think the UFC should book Anderson Silva vs. Nick Diaz and Conor McGregor vs. Nate Diaz for UFC 237 in Brazil?